In Stock. 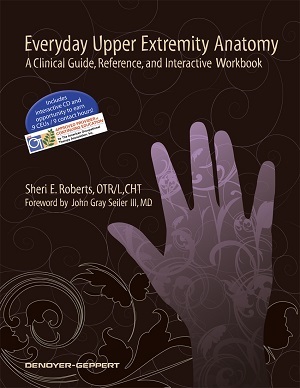 HOORAY This wonderful desk reference anatomy book comes with 9 FREE AOTA approved CE hours after successful completion of included examination. This is a wonderful book to use in the clinic. CEUs issued from Hand in Mind -must send in completed forms to receive CE hours. CE hours must be submitted within 6 months of date of purchase. Must include sales receipt with the CE form. From the outside in: What do you see when you look under your skin? This is an outstanding, must-read study guide for anyone wanting to learn more about anatomy, or for any therapist looking to improve their knowledge base or to prepare for the CHT exam. Topics are covered from A to Z in a simple, concise format that makes it easy to learn. I wish I had this book around when I studied for the exam! This book was a real hit with me. I have been an OT for 29 years, and a CHT since 1991. The book provided the opportunity to review things that I use and see daily in the clinic. I really enjoyed the interactive side. Overall it is well thought-out and would serve as a great resource and review for the seasoned therapist, new graduate, or anyone who wishes to prepare for the CHT exam. Great job.